I may have had some odd expectations when I first came to Tajikistan. I may have thought that I was going to spend the year riding on yaks, defending Sogdiana from Alexander the Great. In reality, I spend most of my time sitting in cafes, trying to explain that I don’t speak Russian. 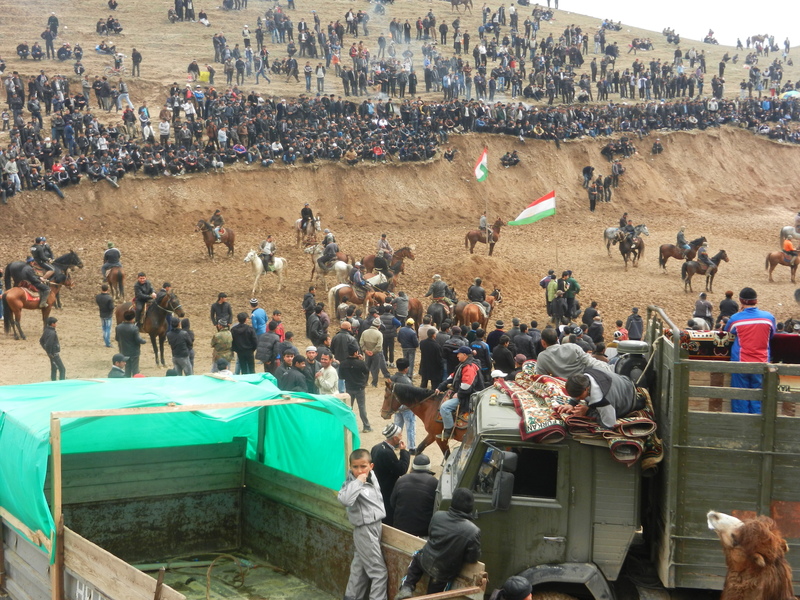 Buzkashi involves a bunch of dudes riding around on horses, trying to steal a goat carcass from each other. They have these crazy whips that they use to pick up the carcass , and to whip everything in sight (including each other). They also wear cool hats. The crazy whips are cow intestines. The cool hats are Soviet tank helmets. The point of the game is to get the goat carcass into the goal. On Saturday, the goal was a big hole dug in the ground between two Tajik flags. When you watch a Buzkashi tournament, you stand up on mountains or hills. Then, down in the valley, all the dudes kash the buz. You can walk down closer to watch. In fact, you can walk down on the field. Many people do this. It greatly increase their chances of being trampled. Some guy decided to set up his snack stand too close to the field, and it got trampled. Good-bye, candy-bars. View of the "stadium." Note the camel in the corner. More on him in a minute. 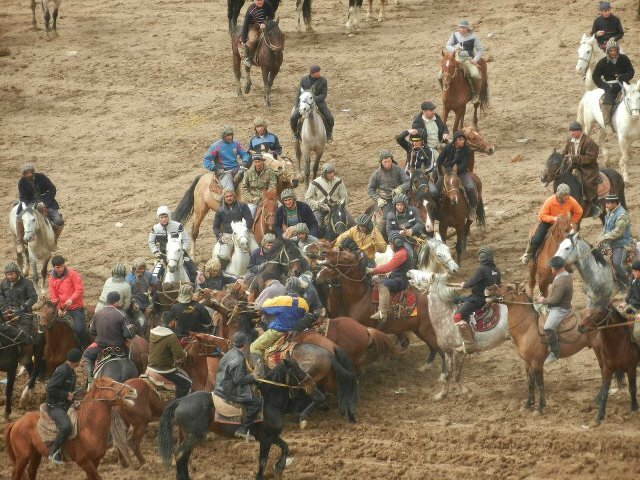 Now then, how would you go about organizing a Buzkashi match? On first gland, it didn’t seem like it needed any organization at all. Anyone who wanted to play could, as long as they brought their horse (or mule. or yak, maybe?). There were not teams. Everyone just wanted to get the buz for himself and shove it in the goal. The game took place in a big valley between two villages about an hour outside of Dushanbe. But, it is actually really well organized. Somebody had to dig up the floor of a valley and turn it into a giant buzkashi field. Somebody had to invite all the villagers and all the foreigners and also the President’s son. Somebody had to organize the prizes. On Saturday, the prizes were mostly rugs. But the “grand prize” was a bactrian camel. I don’t know who won the camel. It was not me. Unfortunately. 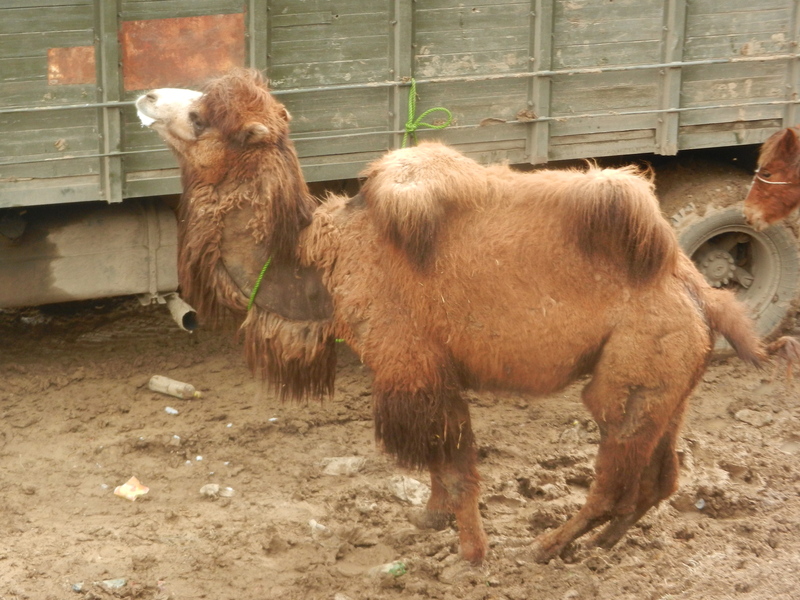 This Bactrian Camel was the grand prize. 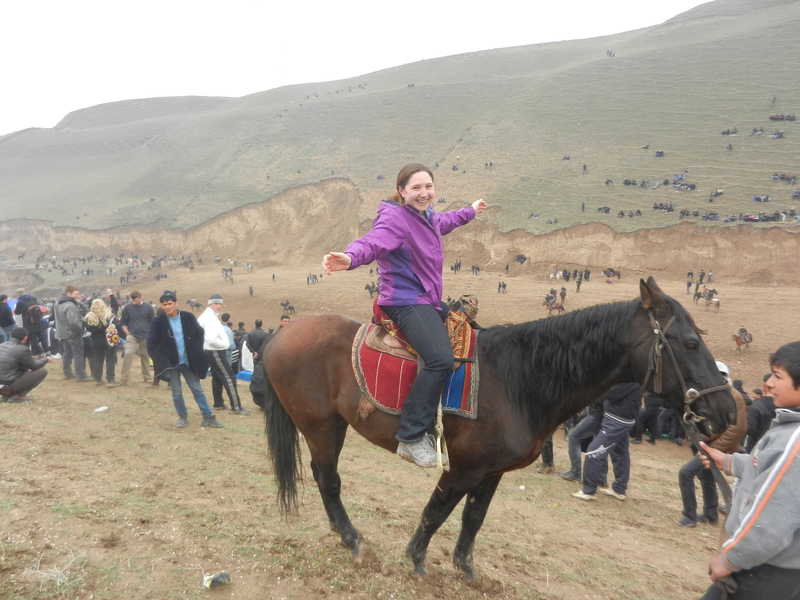 I was pretty excited about Buzkashi. I couldn’t sleep the night before. I kept waking up to see if it was time to go yet, like a little kid before Christmas. Buzkashi feels pretty much like a sporting event anywhere in the world. Kids walk around selling coca cola and seeds and hot dogs. Young people get far too worked up. 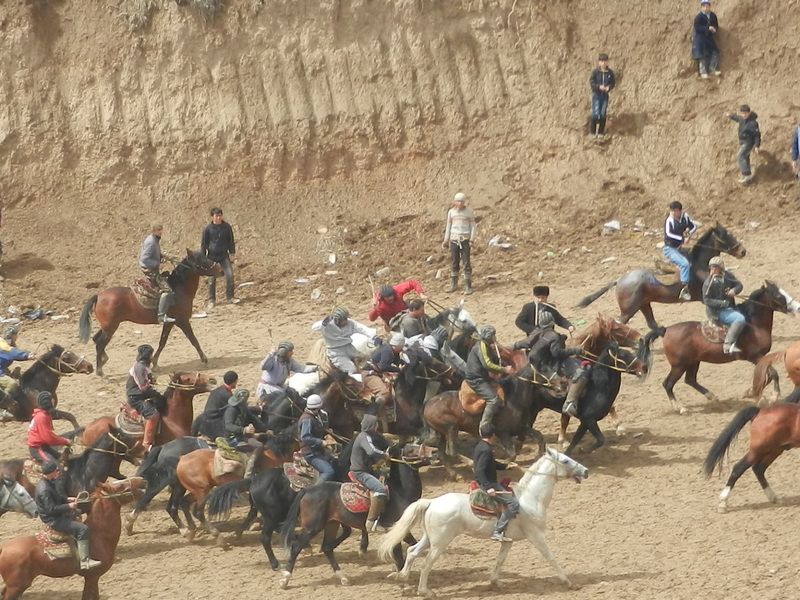 Basically, Buzkashi was like my version of March Madness. For me, in both cases the fun is not so much the competition itself, but the atmosphere and festivities that accompany it. Except usually at sporting events back home there aren’t teenagers goofing around on horseback in the stands. Back home, said teenagers also usually don’t lend you their horse to take pictures with, which is a shame. A young boy lent me his horse in order to snap an awesome photo. I guess Buzkashi wins. Sorry, basketball. The other exciting news is that NOWRUZ IS NEXT WEEK (Reminder: Nowruz is Persian New Year. And the first day of spring). My special Nowruz clothes should be ready by Monday. The seamstress ripped me off, but then she made me feel better about it by inviting me to her house for her Nowruz festivities. I am going to make a mighty fool of myself in the Nowruz show. I have very enthusiastic professors so, somehow, I have agreed to do Dari-language Karaoke and be the Nowruz Princess. If you’re lucky, I’ll have embarrassing photos to share with you all next week. “Don’t be dead or asleep or awake. This entry was posted in Uncategorized and tagged adventure, Attar, buzkashi, camel, Central Asia, dushanbe, Nowruz, Poetry, sports, Tajikistan, Travel, video. I am sorry you did not win a camel. Your mom would have loved having one in your back yard by the pool. What a crazy, fun-filled day!